A financial power of attorney can be one of the most useful legal planning tools because it allows the agent to step in and manage any of your financial matters if you cannot oversee them. Without this document, no one would be able to pay for your expenses or manage other assets like real estate and investments, unless your family or partners underwent a lengthy courtroom process. You can incorporate all of these powers, or you can merely select which powers are necessary. If you know exactly what the agent will need to do beforehand, it is advisable only to select the powers you need the agent to have. For example, if you are going on vacation but have two real estate deals that must complete while you are gone, you can authorize the agent only to close those deals and perform other tasks necessary to close them. The Virginia Power of Attorney Act § 64.2-1622 does not allow you to authorize particular transactions unless you expressly state that you want to in the document. These actions could divest you of a huge amount of property, thus the law helps prevent power of attorney abuse by making you consider these decisions carefully. The subjects include making gifts; creating, revoking, or amending trusts; delegating authority granted under the power of attorney; creating or changing a beneficiary designation; and waiving the principal’s right to be the beneficiary of an annuity. 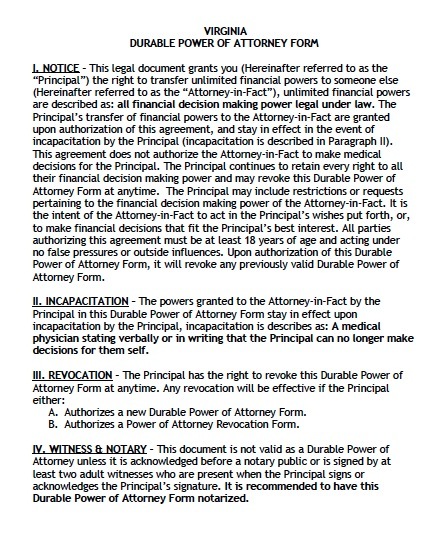 A power of attorney created under this chapter is durable unless it expressly provides that it is terminated by the incapacity of the principal.